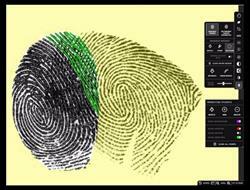 BRATISLAVA, SLOVAKIA--(Marketwired - June 21, 2017) - Innovatrics, an independent provider of biometric software solutions for identity management projects, today announced the launch of its all-new Latent Editor, which simplifies the editing and enhancement of latent fingerprint images, therefore increasing the probability of a match in an AFIS ((Automatic Fingerprint Identification System). Developed based upon feedback from Innovatrics' AFIS customers, Latent Editor was designed to be intuitive and easy to use. Users can easily edit and enhance latent fingerprint records in a secure, independent and interoperable environment. With the smart separation tool, users can easily separate overlapping fingerprints by tagging the relevant ridges and Latent Editor will remove the overlapping print. Additionally, the tool features automatic minutiae and region of interest detection and editing, saving users considerable time and effort in manually detecting these aspects. Once the image has been enhanced, it can be sent directly to the AFIS to be searched against a database. Furthermore, Latent Editor is available as a stand-alone application, usable with any AFIS. Matúš Kapusta, Delivery & Solutions Director at Innovatrics, commented: "Our AFIS customers told us that they wanted a lightweight, easy-to-use tool for editing latent prints. Based on this feedback, we've developed this powerful, intuitive and interoperable Latent Editor. Customers no longer have to edit latent images using a complicated editing tool, then export those images to their AFIS; with Latent Editor, they can optimize the image in a couple of minutes and send the image to AFIS in one click." The development of Latent Editor underlines Innovatrics' commitment to satisfying customer demand and ensuring that AFIS customers do not just have the world's fastest and most accurate AFIS, but that they also have access to a range of tools and applications which add value to their experience with Innovatrics. Innovatrics is an independent, trusted partner for biometric identity management technology. To date, the company has successfully completed over 500 projects in 70 countries, with over 900 million people having been biometrically processed using Innovatrics software. At the core of Innovatrics' biometric solutions are the award-winning Innovatrics algorithms; top-ranked technologies, which combined with an innovative approach and proactive customer care, empower organizations around the world to integrate or build powerful and flexible biometric identification solutions, quickly and easily. Learn more about Innovatrics on the Web, LinkedIn, Twitter, and Facebook.